There don't seem to be any images of Ptychomitrium muelleri available online, so here's another Ptychomitrium species, P. gardneri from China. Photo by Li Zhang. Mosses are often treated as the poor relation in plant diversity. Popular presentations of plant evolution often tend to have even more of a Scala Natura-esque slant to them than presentations of animal evolution, and so mosses and other non-vascular plants get glossed over as mere stepping stones to their more upright "descendants", if they even warrant a mention at all. This is, of course, complete rubbish - mosses have a very respectable diversity of species (about 10,000, according to Tree of Life). I've met a few moss researchers over the years, and a more devoted following a taxon could not hope for. Ptychomitrium muelleri is a haplolepidous moss of the family Ptychomitriaceae (I'll explain what that means in a minute). It grows to a maximum height of one and a half centimetres, and if the type specimens are any indication, prefers to grow on rocks. Ptychomitrium mosses seem to be found more or less worldwide, but Ptychomitrium muelleri itself is found in south-eastern Australia, New Caledonia, southern South America and southernmost Africa. What is interesting about this species' distriution is that it was thought to be endemic to Australia until very recently when Cao et al. (2001) established that species described from each of the other localities were conspecific with P. muelleri. As a result, P. muelleri has what might be described as a classic "Gondwanan" distribution, but I rather doubt that Gondwana had anything to do with it. After all, moss spores are very light and extremely easily dispersed, and surely it is no coincidence that all the localities where P. muelleri can be found lie roughly along the same wind belt. The diagram of a moss life cycle above has been stole from Palaeos.com. 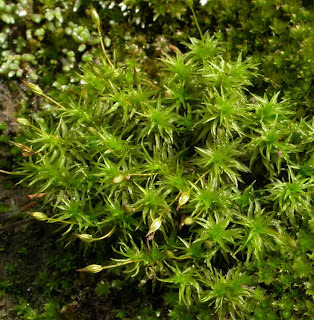 For the nonce, the important details are these - mosses, like other plants, are multicellular at both the haploid and diploid stages of the life cycle, but unlike vascular plants, the larger, dominant stage of the life cycle is the haploid gametophyte. When a female gametophyte is fertilised, the diploid sporophyte remains attached to the gametophyte and grows a spore-filled capsule that eventually breaks open (after the loss of the protective calyptra) to release the spores. Around the mouth of the capsule is a ring of "teeth", the peristome. In basal mosses, the peristome is made up of entire cells, but in the class Bryopsida, the arthrodontous mosses (which includes the larger part of the mosses), the teeth are reduced to cell wall remnants. Most of the bryopsid lineages have two rows of teeth in the peristome, an outer and an inner, but Ptychomitrium belongs to a group called the Haplolepideae or Dicranidae which have only the inner row of teeth. 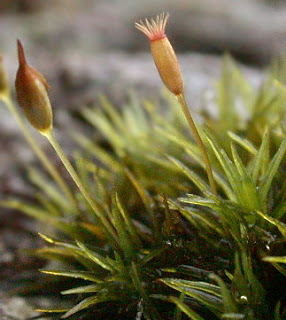 The haplolepidous mosses form a monophyletic clade within the Bryopsida. Ptychomitrium polyphyllum from Scotland, showing the calyptra on the left capsule and the exposed peristome on the right. Photo from here. Most of the features separating moss taxa are microscopic and relate to such things as cell arrangement (which is my weaselly method of saying that I don't understand a word of them), but Ptychomitrium is distinguished by having a mitrate calyptra (and those unsure what "mitrate" means might want to look at the Taxon of the Week post of two weeks ago) with characteristic lobes around the lower edge (Hernández-Maqueda et al., 2008, compare it to a Hawaiian skirt). Ptychomitrium muelleri has (amongst other features) lingulate (tongue-shaped, I'm guessing) leaves with smooth margins, and ovoid capsules. Cao, T., S. Guo & Y. Zhang. 2001. Distribution of Ptychomitrium muelleri (Bryopsida), with its synonyms. The Bryologist 104 (4): 522-526. Hernández-Maqueda, R., D. Quandt, O. Werner & J. Muñoz. 2008. Phylogeny and classification of the Grimmiaceae/Ptychomitriaceae complex (Bryophyta) inferred from cpDNA. 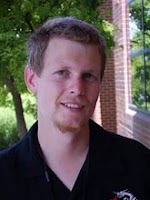 Molecular Phylogenetics and Evolution 46 (3): 863-877. Is always attracted to the cryptic little things it seems. I've met a few moss researchers over the years, and a more devoted following a taxon could not hope for. Robin Wall Kimmerer wrote an interesting and passionate popular book about her work: Gathering Moss. I think mosses are one of the most underrated taxa ever. 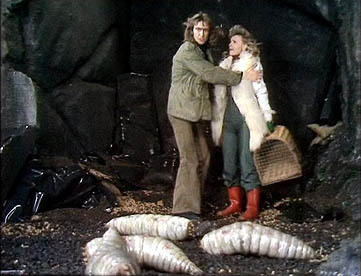 That in this one organism you can find two completely different-looking life forms determined only by whether they possess one copy of the chromosomes or two, and that one form literally lives inside of, and then bursts out of the other one (with a piece still clinging to the top as proof), is just amazing. And you should see the way people's eyes light up in surprise when you tell them that moss have sperm that actually have to swim over the surface of the plant to fertilize the egg. Most people would never *ever* expect that the words "moss" and "sperm" belong in the same sentence. Plus moss are incredibly laid back, genetics wise. They can translate and transcribe human DNA as-is -- I blogged about it here. Is vascularity so hard to evolve that it only ever happened once? Or do vascular plants so thoroughly occupy the the vascularity niche (how could there be such a thing?) that there's no room for another vascular lineage? Or is it, instead, that if vascularity did arise again, we wouldn't recognize it as another lineage? Psi - just to carry the forest analogy further, there is also a whole ecosystem of small animals specialised for life among moss. ncm - as it happens, mosses have evolved a sort of "pseudo-vascular" system, probably independently of vascular plants (see here for a diagram). It's nowhere near as strong as the true vascular system, though. At present, there's no evidence that true vascular plants are polyphyletic. It must be punishingly hard to evolve vascularity, then. I mean, Animalia evolved both eyes and flight dozens of times -- well, four -- and in the (comparative) blink of an eye and the flap of a butterfly's wings. Mosses had an enormous head start, yet remain stuck in the mud. What keeps me from spending more time and attention on them is the frustrating lack of good moss ID guides. Something layman-readable with decent photos that could help get me down to the genus level would be my dream moss guide. Producing a layperson's guide to mosses would be something of a challenge (not impossible - just challenging). As I alluded to in the post, most of the distinguishing characters used in mosses seem to be along the lines of "thick, square cells along the leaf surface vs. thin, wavy-edged cells" or something like that - things that can't be distinguished without putting them under a compound microscope. I suspect that the trick to producing a popular guide would be to ignore the higher classification and look at individual genera, maybe dividing them up by habitat or something like that. Producing a key or field guide is something of an art in its own right, and may draw on a completely different set of skills and characters from taxonomic work. "Head red" vs. "head blue" might be a fairly superficial feature taxonomically, but it could be a great starting place for a key because its something easy to spot right away. Chris - ecosystems like this? There was once a guy who was visiting here to study Euglyphids in the local mosses...must've been overwhelming -- we have A LOT of mosses here!